103 Marlborough is located on the north side of Marlborough, between Clarendon and Dartmouth, with 274 Clarendon to the east and 105 Marlborough to the west. 103 Marlborough was built ca. 1865 as the home of unmarried sisters, Catherine Louisa Hill and Almira H. Hill, on land they purchased from the Commonwealth of Massachusetts on January 3, 1863. The house was originally numbered 93 Marlborough, but renumbered 103 Marlborough ca. 1868. They previously had lived in Brookline with their father, Jeremiah Hill, who died in October of 1862. Click here for and index to the deeds for 103 Marlborough. Catherine Louisa Hill died in May of 1899, leaving her interest in 103 Marlborough to her sister. Almira Hill died in May of 1900. She left 103 Marlborough to her brother, George H. Hill and her nephew, Arthur F. Towne, the son of William B. Towne and Nancy French (Hill) Towne. 103 Marlborough was not listed in the 1901 Blue Book. On November 21, 1900, 103 Marlborough was purchased from George Hill and Arfthur Towne by Augustus Flagg. He and his wife, Lucy (Hobbs) Flagg, who lived next door at 274 Clarendon. He purchased 103 Marlborough to be the home of their daughter, Mary Derby Flagg, and her future husband, Henry Niebuhr Richards, a real estate and insurance agent. They were married in January of 1901 and made it their home. On May 21, 1901, Augustus Flagg transferred the property into his daughter’s name. Henry Richards died in December of 1912. 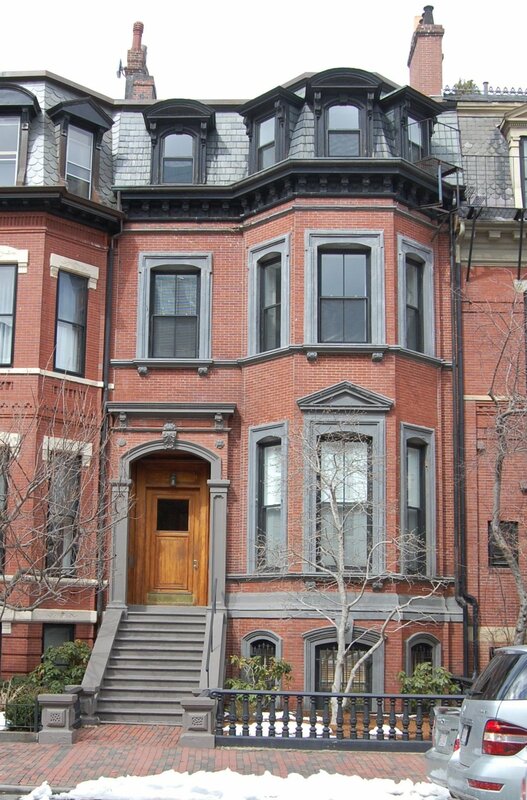 Mary Richards continued to live at 103 Marlborough until her death in January of 1920. On May 25, 1920, 103 Marlborough was purchased from Mary Richards’s estate by attorney Richard Cary Curtis and his wife, Anita Deidomia (Grosvenor) Curtis. They previously had lived in an apartment at 8 Gloucester. They also maintained a home, The Cliffs, in Manchester. 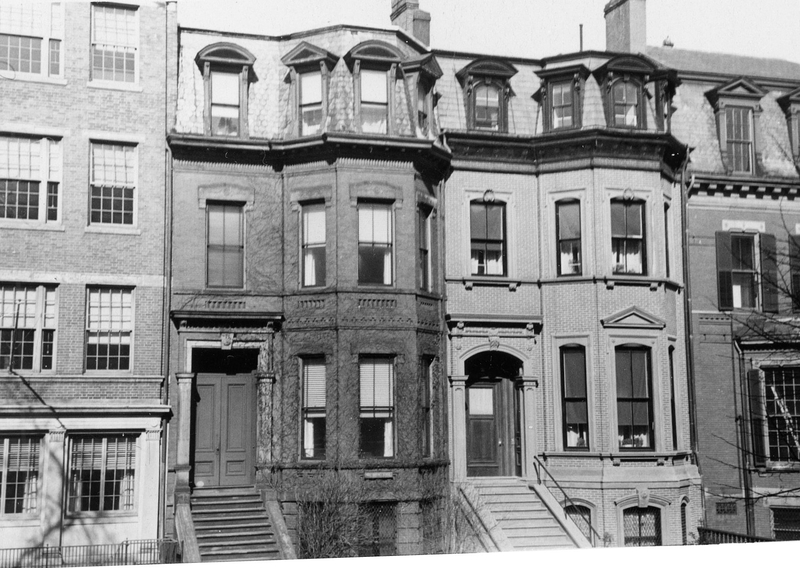 They continued to live at 103 Marlborough during the 1933-1934 winter season, after which they moved to Brookline. They continued to own 103 Marlborough and lease it to others. By 1936, it was the home of Mrs. Mary Walker (Brewster) Cassels, widow of James Donald Cassels, and daughter of Major General Andre Walker Brewster. She previously had lived in an apartment at 172 Beacon. She also maintained a residence in Washington DC. She continued to live at 103 Marlborough in 1939. On August 2, 1940, 103 Marlborough was acquired from Richard and Anita Curtis by Fred L. Arata, a retail liquor dealer and real estate investor. He and his wife, Annette Flossie (Crovo) Boggiano Arata, lived in Brighton. By 1941, 103 Marlborough was the home of Mrs. Lillian (Lydia) F. (Reilly) Clinkard, the former wife of Alfred Harper Clinkard. She previously had lived in Brookline. In January of 1942, she acquired 274 Clarendon, which she converted into a lodging house. She continued to live at 103 Marlborough and on November 30, 1942, acquired it from Fred Arata. On October 27, 1954, Lillian Clinkard transferred both 103 Marlborough and 274 Clarendon to Fred and Annette Arata. She continued to live at 103 Marlborough until her death the next year. In November pf 1955, Fred Arata applied for (and subsequently received) permission to remodel 103 Marlborough into eight apartments. Fred Arata died in December of 1959. On March 31, 1960, 103 Marlborough was purchased from Annette Arata by Alvin Lipsky, trustee of the Alvin Lipsky Realty Trust. On September 5, 1984. 103 Marlborough was purchased from Alvin Lipsky by John R. Giles, trustee of Tenth Capitol Realty Trust. 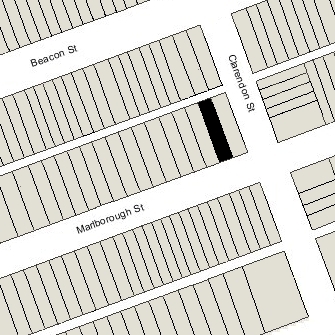 On October 2, 1984, he converted the property into eight condominium units, the 103 Marlborough St. Condominium.